Time is uncountable but you can count the number of hours you have invested in doing something good. But ,when it comes to what we have done, we don’t have a decorated sheet of hours or days we have put in working as csdishaa. It started in 2007 and till date we have passionately invested our capabilities, experiences, towards My Clean India and its empowering and encouraging our youth. Even as you read this, our team is working to create new solutions that will engage and motivate people to achieve their goal of a defined future and a cleaner society. “Without waiting for the governmental agency” intervention, people should voluntarily and spontaneously learn to act on their own to change the state of affairs. Through community campaigning, discussions and other group activities, we want to drive home the message that cleanliness is everybody's business." Have you ever seen up in the sky, balloons of different shapes and colors, and thousands of happy smiles they shower? Now that is the likeness of csdishaa as a change maker - the only differentiating factor is csdishaaa is not filled with helium but with determination. 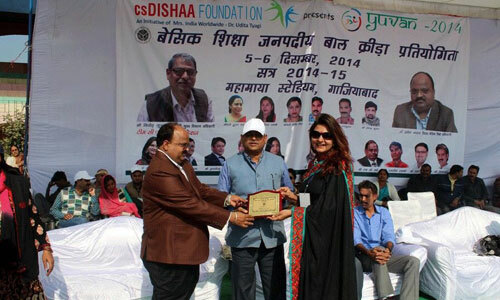 csdishaa Foundation, has been undertaking several initiatives by giving the country a unique platform for interface among Industry, Academia, Society & the Government on the subject dear to our heart i.e. empowerment of youth. csdishaaa Foundation ascertains ground realities by undertaking research based programs across the country covering various sectors.It works for solutions to bridge the gap. These programs across the country have received overwhelming response. csdishaa Foundation is committed to empower people, especially the youth. It promotes opportunities for action and acknowledges those who contribute to the spirit of Foundation which is ‘Commitment towards a Better and Secure Tomorrow’ by a supportive community. This ‘community’ can be your family, friends, schools, groups, towns or cities and your opportunity, perhaps a life-changing experience, is to create leaders to inspire your ‘community’ however small or large that may be. csdishaaa is tirelessly working everyday towards achieving the vision - to transmit the force that says “I AM THE CHANGE” in the society. Be it through numerous cleanliness campaigns across the country, world's first ever war painting museum, introducing career counselling as a part of CBSE curriculum or setting up Project Kaliyaan to augment and encourage girls’ education - csdishaaa has come a long way. The vision of csdishaaa is to spread the message “I AM THE CHANGE” to every Indian. Contributing to India’s biggest cleanliness drive, Swachh Bharat Abhiyan that derives its roots from Remco’s My Clean India, thanks to true the efforts of Dr. Udita Tyagi, aims to achieve its goal by October 2, 2019. So far, we have instilled what we call a habit of cleanliness among thousands of young children through our community programmes in different states and cities to bring sustainable changes in the society. Over the years, csdishaaa has engaged in many esteemed global partnerships to pledge the strengths of Indian youth towards a secure and better tomorrow. Our mission is to reach out to every young and aspiring mind and to make them realize their true inner potential. Our mission is to make the dream of a cleaner, healthier and happier India, a truth of the present and future`. Our mission is to proffer vocational training to our dynamic women who have been deprived of educational facilities, to help them become financially independent so that they can lead our society into a brighter future.